明年再见 (See you next year). That's what i hear from someone bidding my neighbors goodbye after a house visit during Lunar New Year. Normally throughout the year, there won't be any calls/messages & is only during this festive season that people suddenly pop up. Without the lunar new year, most people would be visiting only on funerals or hospitalization. This festive season is also a period for more loss of votes for the hybrid regime with the deterioration of living standards as the peasants curse the hybrid regime among relatives & friends. For my mum, it is cursing the hybrid regime over healthcare hikes. 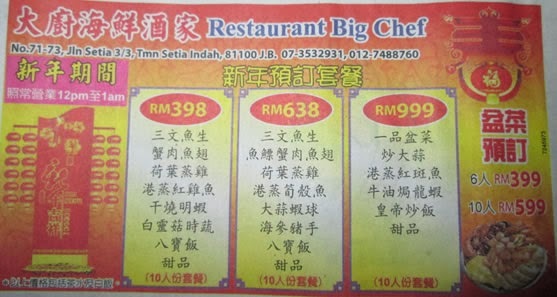 Over in Johor, Malaysia, the cost of having reunion dinner outside is very affordable for sinkie peasants. Difficult part is travelling & the jam. Above is an advertisement from a malaysian newspaper. Entry price per person start from S$16. That's cheaper than a buffet dinner on a normal weekday in any SG eatery. It also shows how costly the prices are in those shopping malls food courts in Sillypore. Suppressed wages in 1st world cost lof living SG. Now that more peasants are downgrading from restaurants to hawker centres, it clearly shows diminished purchasing power. Speaking of hawker centres, the intention of the hybrid regime to turn a few hawker centres to be managed by non-profit organizations or cooperatives is sinister. A sinister intent to start small in their lust for more $$$. I would love it if you could write another post on your thoughts about what you mention "the intention of the hybrid regime to turn a few hawker centres to be managed by non-profit organizations or cooperatives is sinister." What do you think will happen if truly this vile govt go ahead with this plan?